So, I am going to write about this Wizkid matter for the very last time. Anything else after this will no longer concern me. 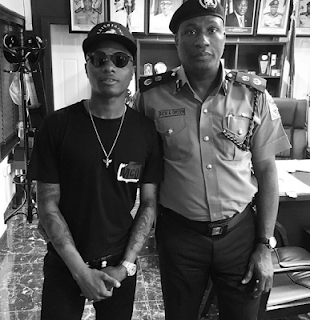 So Wizkid and I met with the Commissioner of Police today and when the Commissioner asked me what I wanted them to do with the case...I told him that I wanted peace. And the reason why I insisted on peace and not to drag the matter further i.e go to court, is because Wizkid and his lawyers have been apologizing since Friday, up until today! Having said that, I turned down taking a photo with him and the police commissioner this afternoon. One of his people took a pic of him and the commissioner with me in it and my people insisted they delete it. Not because I haven't forgiven him, I just don't need the extra drama.